Smart accessories for pets have never been more popular, with everything from smart toys to security cameras on offer for the discerning animal lover. Now, Milan smart home appliances manufacturer Volta is preparing to release a new connected pet bowl that uses artificial intelligence to make sure other animals can't eat your precious pet's food. The Mookkie bowl is set to launch at CES 2019 in Las Vegas, and it features a built-in camera and an embedded circuit board that allows it to recognize your pet. 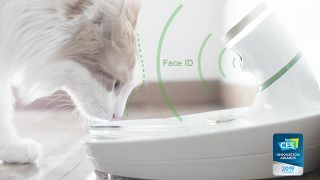 When the sensors on the bowl detect your pet's face, a mechanical panel rotates to expose the tasty treats in the bowl, with artificial intelligence used to distinguish between different animals – this should stop the neighbor's cat getting through your cat flap and eating your pet's food. As well as that, the bowl could prove useful if you have multiple pets with different dietary requirements, stopping them from eating from another's food bowl. Like Furbo's connected dog camera, Mookkie connects to a local network over WiFi, and uses a companion smartphone app to notify you when your pet's about to tuck into its dinner. It can do this by sending you a notification or by sending you a short video of your pet in action. The smart pet bowl also works with Google Assistant, which means you can control the bowl's opening mechanism and even order more pet food when you're running low using voice commands. According to Volta, the recommend retail price will be $189 (around £150 / AU$269 based on current conversion rates), with the bowl expected to go on sale by the September 2019. How well the technology will work remains to be seen; after all, face recognition for humans is difficult enough to get right as it is, although some researchers have achieved success rates of up to 97% when using facial recognition with lemurs. Not only that, but the Mookkie relies on your pet patiently waiting in front of the bowl, which would require training – which can be near impossible when you're dealing with a hungry and stubborn cat.